One of the two leading candidates in the upcoming Colombian presidential election has denounced the country’s militarised drug war and its apparent subservience to US counter-narcotic interests. Gustavo Petro – the founder of the country’s progressive Progresistas movement, and the former mayor of the capital Bogotá – has sharply criticised militarised drug policies for failing to counter the growth of powerful drug cartels nationally and regionally. This failure, he says, has contributed to the “balkanisation of the Colombian territory from very well armed private armies” – referring to the fragmentation of a region into hostile or warring areas, as took place in the Balkan Peninsula in the 19th and 20th Centuries. Speaking on May 1, Petro said that Colombia’s “militaristic approach to drugs has been ineffective”, and that the country should instead implement “social policies in the regions where drugs are cultivated [and] help people escape the mafia”. 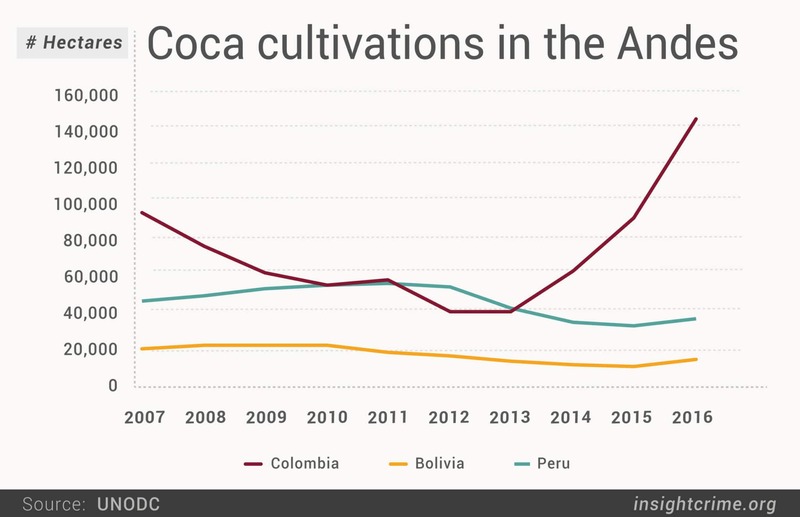 Colombian reclaimed its title as the world’s biggest producer of coca, the raw ingredient used to produce cocaine, in 2013 – and has seen an enormous continued rise since then. Authorities have implemented various, largely ineffective, tactics to quell the country’s coca production. The state has provided financial incentives for farmers to substitute coca with a different crop – which has proved challenging, as farmers claim to earn ten times more money growing coca than from any other crop. The state also undertook forced aerial eradication of farmers’ coca crops until 2015, but this was discontinued – partly due to the herbicide used being identified by the International Agency for Research on Cancer as “probably carcinogenic to humans”. Nonetheless, the US’ Trump administration has been pushing for Colombia to reintroduce this controversial measure. Petro has also expressed opposition to criminalising people for drug use. The soaring rate of drug-related deathsin the US, he says, is “a demonstration that the US policy is a failure”. He recommended that Colombia move away from criminalising people for drug use, and instead direct people who use drugs to treatment services. Despite a 2011 ruling by the Colombian Supreme Court that drug possession for personal use should not be criminalised, thousands of people continue to be prosecuted for simple possession. The number of people imprisoned for drug offences in the country rose from 6,000 in 2000 to over 24,000 in 2016, according to a report by Release – the UK’s centre of expertise and drugs and drug law. Petro was leading in the polls in March, according to Colombia’s National Consulting Centre, but has recently been overtaken by right-wing candidate Iván Duque. The country’s presidential election will take place on May 27, as incumbent President Juan Manuel Santos has reached his term-limit.